Recorded in various locations throughout London by Isambard Khroustaliov. 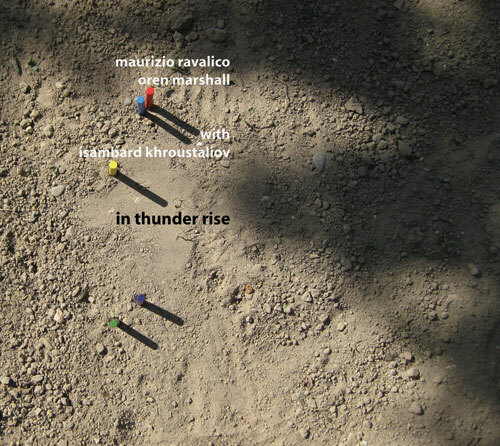 "In Thunder Rise is a work of musical research that affirms a little Copernican revolution: the quest is not a linguistic one from the performers, but rather an active research by the listener. The listener finds himself searching for the sound produced by the musicians within the sound of the environment. To separate, to retrieve, to join, to measure the sounds, to present the ear with an excercise of attention and concentration, which we unconciously practice every day, all day; this is the cipher key of this double album." "Roger Turner would have been much more fun." Recorded during the Summer of 2007, and taken through many phases of minute editing and poetic reframing, this peculiar album finally throws itself into the light, and opens up to outer criticisms and observations. Maurizio Ravalico and Oren Marshall have performed extensively around the London’s improvised music venues circuit, and have explored in painstaking depth the relation between their two instruments, the tuba and the congas, before taking the decision of recording their first album entirely outdoors, within the varied urban environments of London. Isambard Khroustaliov has sound engineered all the sessions, and was creatively involved in the project from the beginning. The performances were recorded using a technique established after few pilot sessions: a pair of microphones was placed fixed above the instruments, while, headphones on and with another stereo pair on a hand-held telescopic stand, Isambard was moving incessantly around the location, now getting closer to the instruments, now running away from them, now focusing on something else that was going on during the improvisations, making musical choices all along the recording process. Although he doesn’t produce any sound, Isambards’s presence can be heard throughout the album, in form of movement and sound depth, making this, under all perspectives, a trio work. The tracks are arranged with disregard of their chronology, following rather a musical path, and fade into each other seamlessly, avoiding any artificial silence throughout the album. What would be in any other instances “background” becomes here an element of the orchestration, compositional accuracy being applied in choosing where and how to exit from one particular environment, and reveal the next. The two volumes of In Thunder Rise are two uninterrupted journeys, each roughly 50 minutes each long, to be savoured with headphones on and closed eyes.